We offer thorough expert mold remediation services for homes and commercial spaces that were flooded or have water damage. Mold can grow in any area with moisture. You may not even know when it is present. Mold grows and spreads easily and can cause serious illnesses. Unlike general building contractors, we deal with mold every day. We have the expertise to eliminate mold from your home or business and make it a safe place to occupy. We remove all carpeting, baseboards, casings, drywall, flooring, and debris from any room that has been affected by a flood. Industrial strength air movers and dehumidifying machines are brought in to remove the excess moisture from the structure of the room. Anti-microbial spray is used to remediate the mold growth and prevent it from coming back. When finished, each machine is disinfected so they don’t harbor any mold growth. When there are no signs of mold anywhere in your home or business, we reconstruct the walls, flooring, and ceiling to their original quality, including drywall, fixtures, and paint. We will replace everything that was taken out of each room. That includes furniture and other belongings. We will put everything right back the way it was and leave your home or business free of water damage and mold growth. 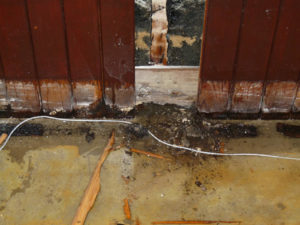 If your home was recently damaged by a flood, call us at (877) 645-1428 for your mold remediation needs.